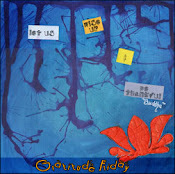 Andrea Bird is my Encaustic teacher. She is also dancing through cancer. Music can bring so much joy into our lives. When the beat starts, the feet start moving. Even in the storms of our lives, we can still find joy.